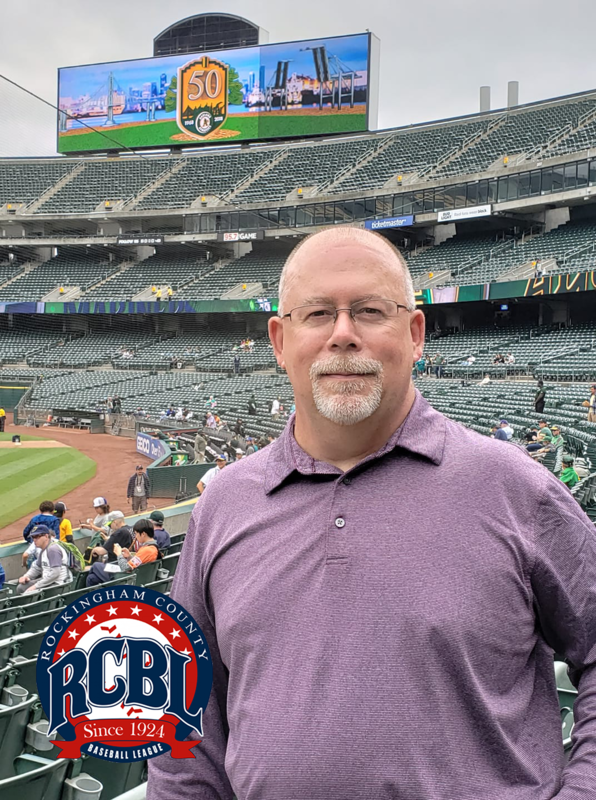 The Rockingham County Baseball League Board of Directors has voted Randy Atkins in as the new commissioner of the league, effective immediately. Atkins will replace Mike Bocock, who served as commissioner from 2015-2018. Atkins has had a long-time involvement with the RCBL, beginning when he served as a bat boy for the Linville Patriots while he was growing up. He most recently served as the official photographer of the league during the 2018 season, providing the RCBL with quality photos for the website and social media outlets. Atkins is currently the Director of Marketing at Valley Care Management, which has been one of the main sponsors of the RCBL in recent seasons. VCM has provided sponsorship for such initiatives as the Play Ball show and the RCBL Passport. While Atkins takes over as commissioner, Bocock will remain a part of the league as well. Bocock resigned from his commissioner post in August to accept the head coaching job with the Woodstock River Bandits of the Valley Baseball League. He will still be involved with the RCBL, serving as the league’s historian. “I wanted to stay attached to the league and also give credit to the people that deserve it by staying as the historian,” Bocock said. The RCBL Hall of Fame and Museum, which houses memorabilia from the league’s history, is located in the Hall of Fame Sports Grill in Cover Hill. BRIDGEWATER- Before Friday night’s game two of the RCBL championship series, Bridgewater Reds IF/P Tyler Bocock was officially awarded the 2018 MVP Award. Nearly three hours later, he showed a massive crowd at Ray Heatwole Field why the award was so deserving. The first six and a half innings of game two were dominated by the Clover Hill Bucks. Ross French gave the Bucks an early 1-0 lead, scoring on a Blake Sipe pop-up that was dropped by second baseman Brian Bocock in the first inning. Back-to-back doubles by Cody Warner and Blake Sipe would plate two more runs, giving Clover Hill a 3-0 lead with starting pitcher Nick Corbin cruising on the mound. Corbin worked through six scoreless innings, producing weak contact and timely ground balls throughout the evening (until things unraveled in the seventh inning). After a solo home run by Danny Grogg put the Bucks up 4-0, it appeared as if Clover Hill was well on their way to pulling even with Bridgewater at a game apiece in this best-of-seven series. Tyler Bocock had other plans. A Tyler Mahone single, Grey Sherfey single, and Kevin Bocock walk loaded the bases with two outs and the just-named MVP coming up to the plate. Bocock wasted no time, sending the first pitch he saw deep over the left-centerfield fence for a grand slam. A longing stare, a quick bat flip, and a few resounding “Let’s go!” from Bocock not only tied the game but immediately gave his Reds all the momentum they would need to complete the comeback. Jared Talley took the hill for the final two frames, throwing two scoreless innings while refusing to allow a hit or a free pass, earning the victory after a 10th inning walk-off from his offense. Bocock would score the game-winning run in the bottom of the 10th inning on a Corbin Lucas walk-off single that dropped in front of Clover Hill center fielder Blake Sipe. Both teams will take Saturday off before returning to the diamond on Sunday evening at Buck Bowman Park for game three. First pitch is scheduled for 7:30 (pending sun, of course). CLOVER HILL - CLOVER HILL- Game one of the Rockingham County Baseball League championship series did not disappoint. In the showdown of all showdowns, the Bridgewater Reds sent Derek Shifflett to mound to match up against the regular season champion Clover Hill Bucks and their ace, Corey Armentrout. The stands were full, excitement and tension ran high throughout the Clover Dome, and the action on the field was exactly what everyone expected it to be. In a truly unbelievable performance, Bridgewater starting pitcher Derek Shifflett threw 147 pitches in a complete game, winning effort to clinch game one of the RCBL championships. Shifflett gave up three earned runs on 11 hits, striking out nine Bucks hitters, all while in obvious pain. Working through the second inning, Shifflett doubled over in pain, holding his oblique area as he walked around the back of the mound. As the crowd fell silent, except for a few gasps from Bridgewater faithful, Shifflett tossed a few warmup pitches and continued on his way. Even though the velocity seemed to dip, Shifflett relied on his pitch selection and defense behind him to finish off one of the more memorable pitching performances in league history. Corbin Lucas, Tyler Bocock, and Tyler Mahone each drove in runs through the first three frames, giving Bridgewater a quick 3-0 lead heading into the bottom of the third. With Drew Easter and Addison Griffin on base in the third, Blake Sipe tied the game up with one swing of the bat, sending a three-run home run over the left field fence. Despite the humid conditions and moist air, the ball slowly carried its way out of Buck Bowman Park, reenergizing the home crowd. The next four frames went scoreless as both teams traded hits and highlight reel defensive plays, including a diving, Gold Glove worthy grab by Sipe in centerfield to save two runs from scoring. Coach Cofer sent his ace back out to the mound to start the eighth inning, quickly pulling Armentrout after he surrendered a leadoff walk to Grey Sherfey. Armentrout was replaced by the RCBL’s top relief pitcher, Eric Yankey to finish out the final two frames. A throwing error by Clover Hill and an RBI-double from Brian Bocock would give Bridgewater a 5-3 lead, enough of a cushion to allow Shifflett to finish off his epic performance. Every single starter on each team reached base at least once as both teams combined for 22 hits in a game that undoubtedly has set the tone for an unforgettable best-of-seven series to decide the 2018 RCBL champion. Game two will take place tonight at Ray Heatwole Field with first pitch scheduled for 7:30 pm. NEW MARKET - The New Market Shockers defeated Bridgewater 10-2 last night to stay alive in the third game of their semifinal series. The Reds went up early in the game as Kevin Bocock came around to score on a fielder's choice in the first inning. The Shockers answered back with two runs during the bottom of the third, starting with a single from Joseph Rutherford that scored Zach Stiles. Errors from Bridgewater allowed the Shockers to capitalize multiple times last night. After a wild pitch, Rutherford stole home to make the score 2-1 going into the fourth. The Reds would score another run in the top of the sixth, but New Market answered back with runs in the sixth, seventh and eighth innings to end up on top. Pitcher Colin Benner shut out Bridgewater the last three innings of the game. He pitched all nine innings, giving up just two runs and striking out nine batters. “We're going to play basic baseball, cut down on errors. We're going to put bat on the ball, force them to make plays, cut down on strikeouts and throw some strikes,” Rush said about his teams mindset going into the next game. The Shockers and the Reds will meet again at Bridgewater’s home field tonight for the fourth game in the series. First pitch is schedule for 7:30pm. CLOVER HILL - The Clover Hill Bucks lost the 2017 finals in five games, but they’re using that as motivation. As they celebrated getting back to the championship series on Saturday night, cheers of “Unfinished business!” rang out among the team. A 2-1 victory in a pitcher’s duel at Buck Bowman Park sent the Bucks back to the championship series for the second-straight year. After finishing the regular season with a record of 23-5, the Bucks have swept both of their opponents in the playoffs. They defeated Montezuma in two games in the quarterfinals before knocking Grottoes out in three games. The Bucks’ strong pitching staff, which is stacked with three All-RCBL pitchers, has only gotten better in the postseason. Perhaps the biggest contributor to the Bucks’ win on Saturday, starter Kevin Chandler pitched eight innings, giving up just one run and striking out seven batters to send his team back to the championship. Chandler didn’t allow a baserunner through the first three innings and had five total innings in which he retired the Cardinals in order. He didn’t allow a walk on the night and rarely got behind in the count. Chandler isn’t the only Clover Hill pitcher to have a successful outing in the semifinals. Corey Armentrout struck out 10 batters in a 3-2 win in game one while Nick Corbin allowed just one hit through six innings in game two. Eric Yankey earned saves in games one and three, proving just as effective as he was during the regular season. While pitching has been the focal point of the Bucks, they have been able to get the job done offensively as well. “We had some really hard-nosed at bats in some key spots, like the Easter RBI there in the seventh or eighth, so I think our focus has gotten locked in a little better after the long rainout,” Cofer said. The RBI he mentioned was a two-out double by Drew Easter that scored Kevin Kirk to give the Bucks the lead in the seventh inning. The game had been close all night and Grottoes tied it in the top of the seventh, but as Cofer said, the Bucks have gotten clutch at bats at the right time. After losing in the first round of the playoffs in 2016, the Bucks are back to usual form. Saturday’s victory gives Clover Hill the chance to compete for their 18th league championship, something they haven’t accomplished since 2015. Chandler believes a change in mentality is what helped the Bucks get back to title contention this season. The Bucks will face the winner of the New Market/Bridgewater series in the finals. Bridgewater is currently up 2-0 in the series with game three being played tonight at New Market. Whoever their opponent is, don’t expect the Bucks to make significant changes to their game plan. BRIDGEWATER - Following up their 12-run performance on Thursday night, the Bridgewater Reds defeated New Market 11-0 in game two on Friday. The Reds’ 12 hits combined with eight errors by New Market led to a shut-out win to take a two-game lead in the series. Much like Thursday's game, a few key innings proved to be the difference for the Reds. Bridgewater’s offense started off slow, scoring one run each in the first and third innings. The offense exploded in the fifth for five runs on five hits and four errors. Tyler Bocock, Wright, Brian Bocock, Corbin Lucas and Andrew Armstrong all came around to score in the inning. The Reds scored three more runs in the sixth to make it 10-0. The final run of the game came on a solo shot to straightaway centerfield by Tyler Bocock in the eighth inning. Four Reds had multi-hit games, including Wright, who finished 3-for-4 with two runs scored on the night. “The guy coming in first was a sidearmer, so we just tried to stay with a good approach and go with inside pitches best we could and it seemed to work tonight,” Wright said about his mentality at the plate. Bridgewater starter Tucker Garrison got the win on the mound, pitching six innings while striking out eight batters. Garrison gave up just three hits and one walk on the night. The Reds now have a 2-0 lead in the series heading into game three on Sunday night. Sunday’s contest will be a home game for the Shockers back at Rebel Park. NEW MARKET - After multiple rain delays and cancellations, the first game of the Bridgewater versus New Market series was completed last night. The Reds took home a 12-5 win to take a 1-0 lead in the semifinals. New Market had a strong start by capitalizing on the mistakes that the Reds made in the first two innings. The Shockers got two runs on the board in the bottom of the first inning. They added three more in the second to take a 5-0 lead. “I think we struggled early, but took a deep breath, settled in and had a good third inning and just kind of kept it going from there,” Tyler Bocock said about the Reds performance on Thursday. The Reds answered back to those five runs by bringing home 10 runs in the top of the third. Starting with a single to left field from Corbin Lucas that brought home Tyler Bocock, the Reds scored 10 runs on 10 hits to break the game open. The Reds kept the Shockers from advancing home the rest of the night while the Bridgewater offense kept the runs coming. Bridgewater scored one more in the fourth inning and put another run across in the ninth to take the win in game one. New Market and Bridgewater will play again in the second game of the series tonight at Ray Heatwole Field. GROTTOES - ​GROTTOES- The Clover Hill Bucks are now just one win away from punching their ticket to a second-straight trip to the RCBL championship series, after defeating the Grottoes Cardinals 9-5. Nick Corbin took the mound for the Bucks, giving up just one hit across six innings of work on the road, at Shifflett Field. The lone hit allowed came in the first inning, a ground-rule double off the bat of Keegan Woolford. Woolford and Ray Tricarico would come around to score on an error, later in the inning, however, that would be the only runs allowed by Corbin and his defense, until the seventh inning. Despite falling behind early, the offense of Clover Hill exploded for 12 hits, including six combined base-hits from Tanner Moyers and Kevin Kirk. Each added a walk on the night, reaching base a combined nine times on the evening. Every single Bucks’ starter reached base at least once, adding seven walks to their 12 hits. The Cardinals attempted a comeback in the bottom of the seventh, scoring three runs off relief pitcher Tyler Conley, including an RBI-single by Woolford to bring the Cardinals to within four. Grottoes proved unable to close the gap anymore over the final two frames. The bullpen duo of Jordan Showalter and Waring Garber combined for 2.2 innings of scoreless relief to close out the game. Both teams will take tonight off before resuming the series on Saturday night at Buck Bowman Park. If Clover Hill wins, they clinch the five-game series. Should Grottoes battle back for a victory, the series returns to Shifflett Field on Sunday evening, for game four. CLOVER HILL - The Clover Hill Bucks and Grottoes Cardinals hadn’t played since the end of the July, when both teams completed first round sweeps in the RCBL playoffs. Last night at Buck Bowman Park, the two teams finally began their semifinal matchup, resulting in a 3-2 Clover Hill win. Corey Armentrout took the mound in game one for the Bucks, striking out 10 Cardinals in seven innings of work. He allowed no earned runs on seven hits and did not issue a single free pass. Armentrout looked confident the entire outing, saying after the game, “I believe in my stuff. I’m a fastball pitcher and I’m able to spot up and command.” Evident by his zero walks and starting all but three at-bats with a first pitch strike, through his first six innings of work. Coach Cofer handed the ball to All-RCBL closer Eric Yankey, who slammed the door shut on Clover Hill’s game one victory, giving up just one hit and one walk while striking out four over his two innings of relief. Grottoes starting pitcher Josh Pittman kept the bases clean before hitting Danny Grogg to lead off the bottom of the third inning. Grogg would later score on an RBI-single by leadoff hitter Ross French for the first run of the evening. Clover Hill would add another run in the next frame on an RBI-single by Grogg, scoring Blake Sipe to put the Bucks up 2-0. Grottoes came back to tie the game in the top of the fifth, scoring two runs on a Clover Hill error with bases loaded and two outs. However, another Ross French RBI in the sixth proved to be all Clover Hill would need to secure the victory. The Cardinals refused to go down quietly, getting two men on base via hit-by-pitch and a walk in the ninth. The game came down to the league’s best reliever in Yankey vs. one of the league’s top power hitters in Keegan Woolford. Playoff baseball at its finest. Woolford quickly fell behind 0-2, eventually falling victim to the strikeout to wrap up the game. “I think we were ready to get after it, after sitting back with all this rain. It’s always a pretty big deal to get the first game under your belt and gain confidence as a team,” said Armentrout after the game. Game two of the series is tonight at Grottoes.